The selec­tion of a new CEO is the ulti­mate next step for any enter­prise. Microsoft’s selec­tion of a new CEO this week offers us the chance to analyse the impor­tance of tak­ing the right step. Few com­pa­nies offer such a tan­gle of ele­ments that allow us to pre­dict with some accu­ra­cy the prob­a­ble direc­tion for Microsoft as far as any of us can see. If you judge by the as-wide-as-pos­si­ble dis­play of Satya Nadella’s pho­to on the Microsoft web­site [link], part­ly cap­tured below, it’s clear that Microsoft sees this change in lead­er­ship as a BIG change for the com­pa­ny. 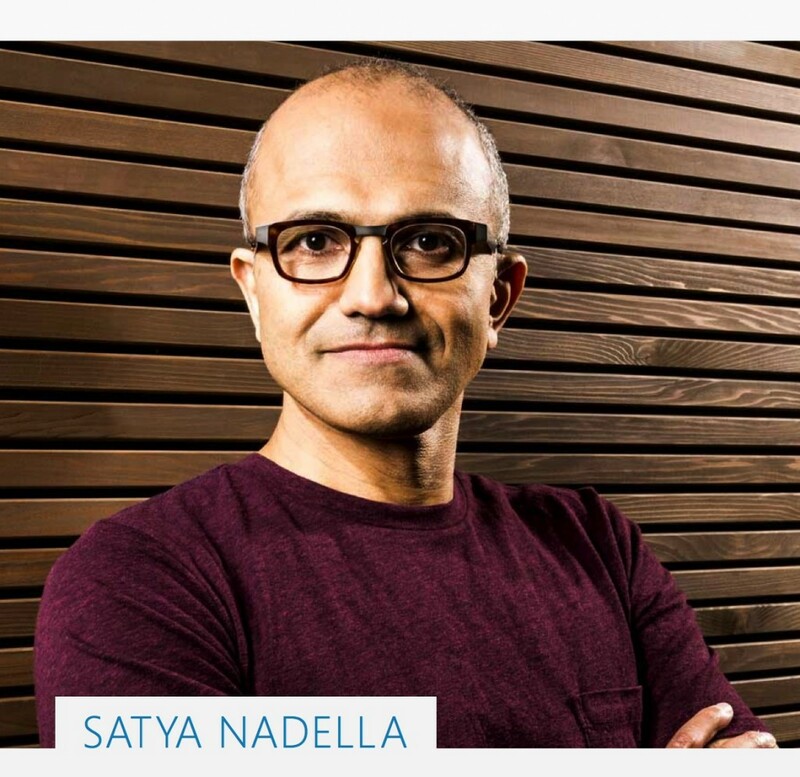 Con­sid­er the stage onto which Nadel­la (@satyanadella) stepped this week. There was the leg­endary co-founder and orig­i­nal CEO, Bill Gates. There also was Gate’s hand-picked suc­ces­sor, whom Nadel­la suc­ceeds: Steve Ballmer. Nadel­la assumes the lead­er­ship of a com­pa­ny that gen­er­at­ed close to $78 bil­lion USD in rev­enue last year. It still has a huge lev­el of influ­ence on the desk­top com­put­ing world, and Nadel­la has said that he wants to hon­our Gates by invit­ing his future par­tic­i­pa­tion on the strate­gic direc­tion of the com­pa­ny — a clear point of def­er­ence to Microsoft’s past. Yet, in an e-mail let­ter to all Microsoft employ­ees (but wide­ly pub­lished around the world) [link], Nadel­la made it clear that he is aim­ing for a seis­mic shift in how its core prod­ucts and ser­vices (soft­ware) are built, deployed, and cre­ate val­ue for cus­tomers. While we have seen great suc­cess, we are hun­gry to do more. Our indus­try does not respect tra­di­tion — it only respects inno­va­tion. This is a crit­i­cal time for the indus­try and for Microsoft. Make no mis­take, we are head­ed for greater places — as tech­nol­o­gy evolves and we evolve with and ahead of it. Our job is to ensure that Microsoft thrives in a mobile and cloud-first world. Nadel­la has made it clear that Microsoft’s past is not what will pro­pel it into the future. It is, in a way, a dec­la­ra­tion that is as pro­found as that of Boe­ing and oth­ers when they stopped mak­ing pro­peller-dri­ven air­planes. Good­bye, Microsoft of old. Hel­lo, Microsoft of new. This is a crit­i­cal inflec­tion point, not only for Microsoft but also for soft­ware in gen­er­al and com­put­ing as we know it. The move­ment from desk­top to mobile/tablets is a giv­en, as far as mass com­mu­ni­ca­tions and search con­cerned. And, while Microsoft will not aban­don its Office suite, it’s mak­ing it much more expen­sive and dif­fi­cult to pro­cure out­side of the realm of cloud-based down­load­ing. Look­ing at all the pro­duc­tiv­i­ty soft­ware, it’s plain that Google Docs (and oth­ers) are chal­leng­ing Office as nev­er before. One lev­el up from appli­ca­tions is, of course, the oper­at­ing sys­tems bat­tle, which is being fierce­ly fought. There are three war­riors: Microsoft Win­dows, Android/Google, and Apple’s iOS; and this field remains a mul­ti-bil­lion dol­lar con­test. In our ear­ly his­to­ry, our mis­sion was about the PC on every desk and home, a goal we have most­ly achieved in the devel­oped world. Today we’re focused on a broad­er range of devices. While the deal is not yet com­plete, we will wel­come to our fam­i­ly Nokia devices and ser­vices and the new mobile capa­bil­i­ties they bring us. As we look for­ward, we must zero in on what Microsoft can unique­ly con­tribute to the world. The oppor­tu­ni­ty ahead will require us to reimag­ine a lot of what we have done in the past for a mobile and cloud-first world, and do new things. You can eas­i­ly find arti­cles that sug­gest that Steve Ballmer was pushed out of the top job at Microsoft [link], sim­ply because he was not going to lead the com­pa­ny in the direc­tion demand­ed by the mar­ket­place. Yet, one has to acknowl­edge that Nadel­la has been with Microsoft 22 years. He’s an insid­er and may be averse to shak­ing up the cul­ture as much as an out­sider could have done. How will we know if he has a chance to suc­ceed? Watch for piv­ots in the company’s strate­gic empha­sis and for cul­tur­al changes that seem to be com­ing at a faster pace than Ballmer was able to exe­cute. Strat­e­gy and cul­ture. Cul­ture and strat­e­gy. The intri­cate mix of these two aspects of lead­er­ship cre­ates either great com­pa­nies or cor­po­rate crash­es. To be sure, Microsoft will have to find its next in a land­scape that is flu­id, idio­syn­crat­ic, and fraught with dis­rup­tion and ambi­gu­i­ty — a land­scape that will require think­ing in new ways, reshap­ing strate­gic intent and chal­leng­ing the sta­tus quo. Though I do not per­son­al­ly know Nadel­la, I wish him luck. Wel­come, Satya, to the world of nextsens­ing.